The Maison des Jardies stands on the south-facing slope of the Saint-Cloud estate. It was originally a simple wine-grower’s house. With its relaxing surroundings and its ideal location close to Paris, it attracted a number of important figures in the 19th century, many of whom left their mark on the site. 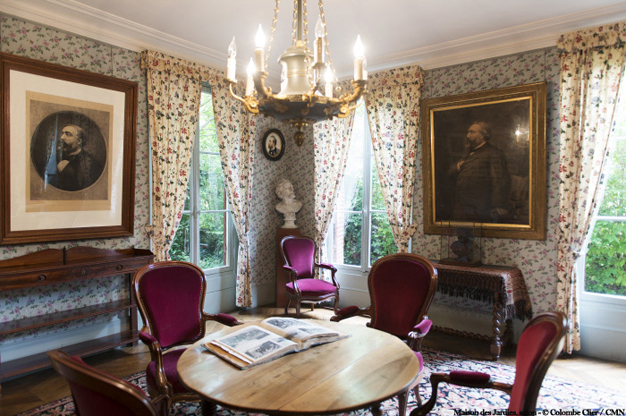 In 1837, Balzac moved to the area known as Les Jardies, living in a large property that he decided to divide into plots. He moved his gardener, Pierre Brouette, into the wine-grower’s house. This dwelling was then purchased by Léon Gambetta in 1878 for the modest sum of 40,000 francs, including furniture. His plan was to use the property as a place to escape from his career as a powerful parliamentarian, along with Léonie Léon, his partner since 1872. The property was extended on several occasions but nevertheless remained modest in size, with only a small number of narrow rooms, with low ceilings and dim lighting. The only exception to this rule was the much more spacious and brighter lounge, which was added to the building in the mid-19th century. Gambetta had to build a pavilion at the foot of the property (no longer in existence) to house his library – yet more evidence of the lack of space in the small building, which he initially purchased as a country getaway. Sadly, he was unable to enjoy the property for long. Following an accident with a gun, his health deteriorated rapidly. He subsequently contracted peritonitis and died at Les Jardies on December 31st, 1882, at the age of 44. The house subsequently became a place of pilgrimage, and was visited by numerous politicians and Gambetta’s many admirers. In 1887, the family left Les Jardies to the French state, in honour of the memory of the most iconic founding father of the Third Republic. In 1889, Gambetta’s sister, Benedetta Leris, donated a plot of land adjoining Maison des Jardies to the French state so that a monument could be erected in memory to her brother by the Comité des Alsaciens-Lorrains. The funds were raised from the local population in Alsace and Lorraine, both of which had been annexed by Germany since 1871. The statue, designed by Alsatian artist Auguste Bartholdi, was unveiled with great fanfare on November 8th, 1891. It is an ode to Gambetta’s critical national defence work, to a man who never gave up on Alsace and Lorraine despite the Prussian victory. His decision to represent Strasbourg in the French parliament, even though Alsace was under occupation, is the most poignant illustration of his dedication. Until 1920, the base of the monument also housed Gambetta’s heart. It was subsequently transferred to the Pantheon at the same time as the body of the unknown soldier, during a ceremony that symbolically united the “saint” and the “martyr” of the Republic. The property was listed on the inventory of Historic Monuments in 1991 and was awarded the “Maison des Illustres” (famous people's houses) label in 2011.